"Mister Pay Your Money Down"
The roads that had been built by the Romans in England were allowed to deteriorate and by the beginning of the 18th century British roads largely consisted of dirt tracks. However, the need for better communications was realized and the concept of toll roads, or turnpikes, was introduced. The first of these was the improvement of the Great North Road, now the A1, connecting London and York. It was upgraded as a result of a 1663 Act of Parliament. Little more was done until 1706, when "Turnpike Trusts" were introduced, effectively placing road development on a commercial basis. This began an era of major road improvement and road building, which was to last until the first part of the 19th century. By 1750 some 13 strategic turnpikes radiated from London and were of sufficient quality to bring in the era of the stagecoach. 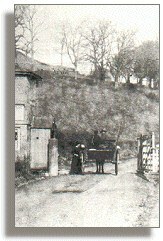 Many new roads were built in the period up to 1772 and stagecoach journey times were reduced. At the beginning of the stagecoach era it took 12 days to travel from London to Scotland, but this was reduced to nine days and less by using relays of horses. By 1770 light post-chaise vehicles could do the journey in five days. During the first three decades of the 19th century, methods of highway construction were pioneered by the work of two British engineers, Thomas Telford and John Loudon McAdam, and by the French road engineer Pierre-Marie-Jerome Trésaguet. Telford's system of road building involved digging a trench and installing a foundation of heavy rock. The foundation was raised in the centre so that the finished road was sloped away from the centre, allowing drainage to take place. The topmost layer of the road consisted of a 15-cm (6-in) layer of compacted broken stone. McAdam held that well-drained earth would support any load. In McAdam's method of road construction, the finishing layer of broken stone was placed directly on a foundation of earth that was raised above the surrounding ground to ensure the foundation drained properly. McAdam's system, called macadamization, was generally adopted at the time, especially in Europe. When heavy trucks were used in World War I, however, the earth foundations of macadamized roads could not bear the heavy road load. As a result, Telford's system was adopted for the construction of heavy-duty roads, because it furnished a better distribution of road load over the underlying subsoil. Another road pioneer, John Metcalf, built more than 290 km (180 mi) of roads in Britain. More than 1,000 turnpike companies, maintaining 32,000 km (20,000 mi) of roads, were in operation in Britain in the 1830s, when the competition from railways began to make the turnpike system less profitable for the operators. In 1835 some 3,300 stagecoaches were in use. It was possible to travel from London to major cities up to about 200 km (125 mi) away in a day, and there were 40,000 km (2,500 mi) of roads in England and Wales. The advent of the railway had an adverse effect on the stagecoach and many turnpikes began to deteriorate as the trusts were unable to raise sufficient income for their upkeep. In 1888 an Act of Parliament was passed that transferred responsibility for roads to local government authorities. and maintaining roads; turnpike trusts.